TRANSIT NEIGHBORHOOD planning was the subject of small group discussions among Planning Dept. staff and local stakeholders at a recent workshop. With Metro Rail Purple Line Extension construction underway, there are lots of people planning for a denser future in this part of town. In the city of Los Angeles, plan making is under the purview of the Dept. of City Planning, headed by local resident Vince Bertoni, who reports to Mayor Eric Garcetti (also a local resident!) and the City Planning Commission appointed by the mayor. In addition, when there are specific projects proposed for actual construction, the permit-issuing Dept. of Building and Safety refers the projects for review by other agencies. City planners (and many other city staff members as well, think fire department, transportation, etc.) must sign off. Keeping planners busy right now is a proposed “transit neighborhood plan” (TNP) for areas between Pico Blvd. and Third St. or Beverly Blvd., mostly west of Highland Ave., extending to the Beverly Hills border. The planning department is “developing regulatory tools and strategies … [that] aim to encourage transit ridership, promote job creation, enhance the urban built environment, and focus new growth and housing in proximity of transit and along corridors while protecting the character of single-family neighborhoods.” See: latnp.org/purple-line. 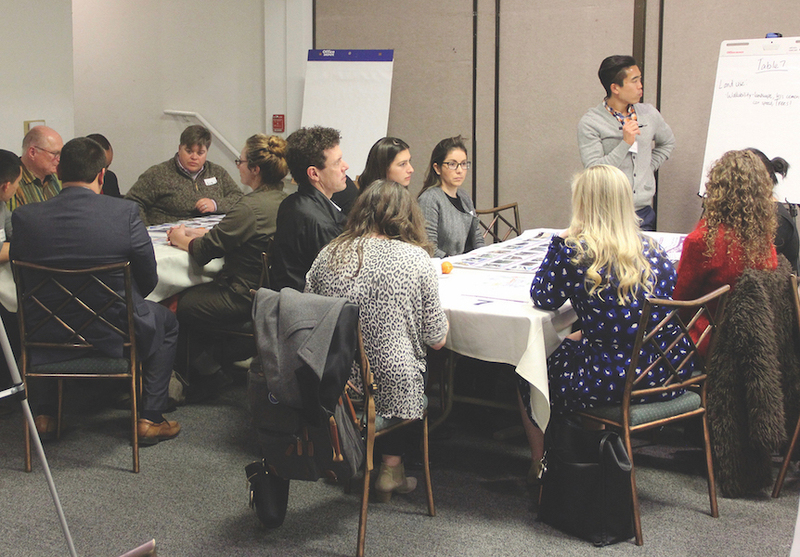 Approximately 50 planners and neighborhood residents turned out in late February for a workshop to discuss the planning department’s draft TNP proposals. Planners sought attendees’ responses to images of alternative kinds of designs and massing for new buildings expected to be proposed and constructed in proximity to the three Purple Line subway stations (La Brea, Fairfax and La Cienega). DEVELOPER of new apartments on the Third Street KMart site, Tom Warren of Holland Partner Group, explains a rendering of the project to stakeholders at Dept. of City Planning EIR scoping meeting. A specific example of a project for which a permit application already has been submitted, and which now is embarking upon extensive environmental review, is the approximately 330-unit apartment project proposed to replace the vacant KMart adjoining Whole Foods at Third and Fairfax. 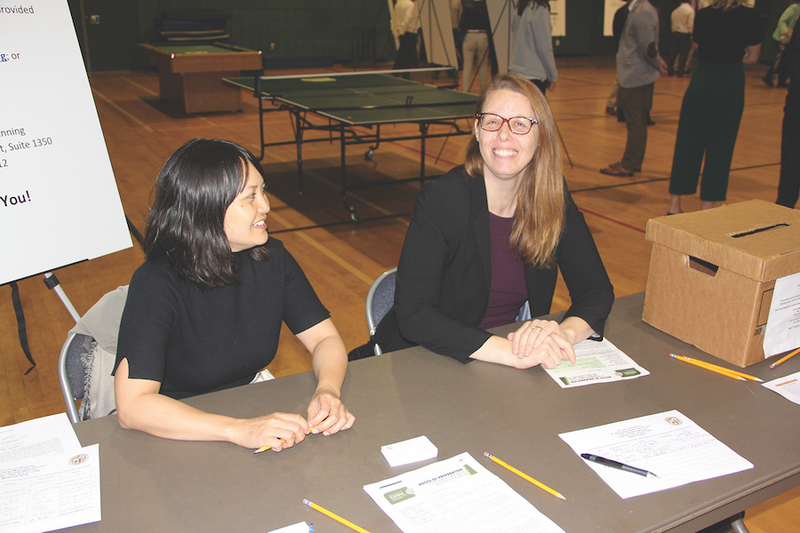 To start the EIR process last month, public comments were solicited at a March 6 meeting at the Pan Pacific Senior Activity Center and through correspondence. CITY PLANNERS Mindy Nguyen and Kathleen King oversee the EIR scoping meeting for the mixed-use project proposed for Third and Fairfax. The comments will help city planners Mindy Nguyen, Kathleen King and their Dept. 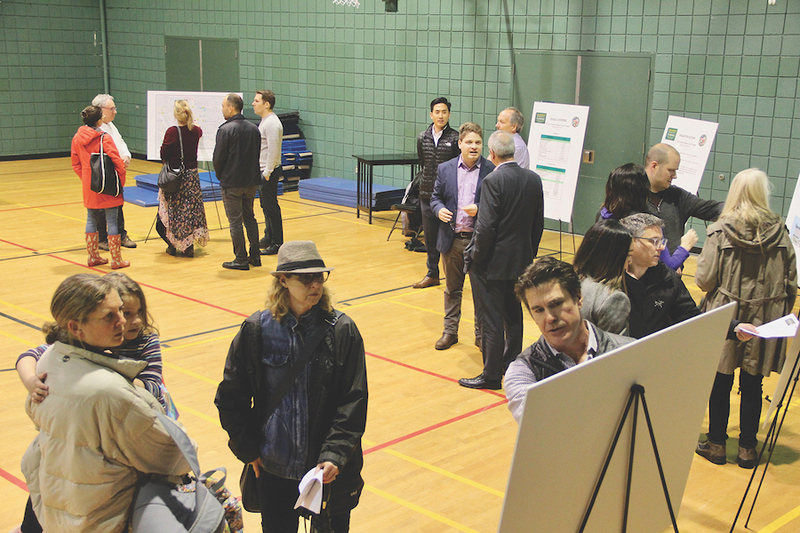 of City Planning colleagues determine the project impacts, alternatives and mitigation measures that need to be studied to lessen environmental impacts from construction and long-term operation of the proposed project. The project also includes retail on the ground level of what is now planned as an eight-story building. Among the issues being studied is the project’s adjacency to Hancock Park Elementary School.